North Korean leader Kim Jong Un met with visiting Cuban president in Pyongyang and discussed “crucial issues of common concern” on the current international situation, the North’s state media reported Monday. 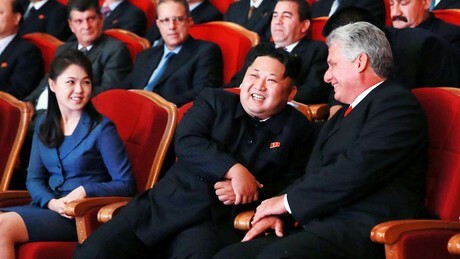 The visit by Miguel Diaz-Canel comes amid stalled talks between North Korea and the United States and only days after Washington imposed fresh economic restrictions on Cuba. Washington’s ties with Havana were fully restored in 2015 after more than half a century of enmity, but have deteriorated since President Donald Trump took office. Communist Cuba is one of North Korea’s few remaining allies. “There was an in-depth exchange of views on the crucial issues of common concern… on the international situation and a consensus of views on all issues was reached,” said the official KCNA news agency. Diaz-Canel was greeted by Kim and his wife Ri Sol Ju at the Pyongyang International Airport on Sunday, KCNA reported, where he was given a 21-gun salute and later attended a banquet and enjoyed a special welcoming concert with them. Giving a toast at the banquet, Kim said his meeting with the Cuban leader “marked a watershed in demonstrating the will to carry forward forever the friendship between the two countries”. 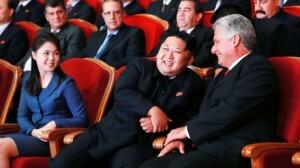 In response, Diaz-Canel said he was willing to “meet all challenges by the hostile forces” while carrying forward their “traditional friendly and cooperative relations”, according to KCNA. Diaz-Canel took office in April in a historic transition of power on the Caribbean island, succeeding Raul Castro, who took over from his elder brother Fidel, father of the 1959 revolution. Fidel Castro visited North Korea in 1986 to meet founder-leader Kim Il-Sung, and Pyongyang held three days of official mourning when Castro died in November 2016. North Korea sent a delegation led by Choe Ryong-Hae, a senior aide to its leader Kim Jong Un, to Havana for Castro’s funeral. Cuba in the past has flouted international sanctions imposed on North Korea over its nuclear weapons programme. In 2013 Panama seized a North Korean ship carrying an undeclared Cuban arms shipment of Soviet-era weapons and fighter jets hidden under sacks of sugar. North Korea insisted the weapons were being shipped for repair, prior to their return.